Uhm...I guess this was another one of those 'must keep my sanity intact' walls that I've been working on in between taking breaks from working on my thesis. I nearly forgot how to work in PS after not opening it for a month. Not much was done here in terms of originality - I extended the scan, vectored some lines and painted the rest, my usual MO. I know this is not one of my best works but I don't really care, meh. I needed something to vent on and this bishie was the first thing that caught my eye. So, yeah. Feedback is, as always, welcome. Original scan: HERE. Planet brush is from dA. another great one alenas. I really like this one. the brushes are quite nicely used. the background effects on the planet and night sky just remarkable. even the shadows cast by the stone wall. And the guy, quite the remarkable creation. I can see why this one made it to elite status so fast. can't wait to see what new piece might appear with your name attached to it. Seriously. Thanks, Alenas! You put so much work in your walls so it's worth every single fave. And even more! 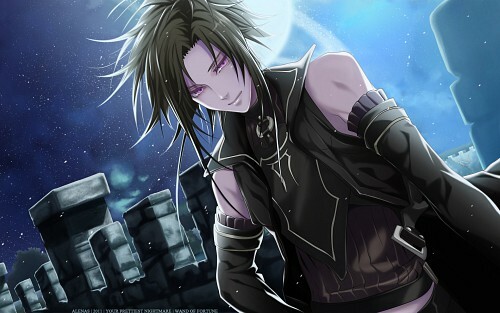 I love how you painted the bg *___* but he is so hot XD! Uwahhh so gorgeous~ Every tiny detail is perfect. The sky especially is extremely well done. Even though you say it's not one of your best works I'll argue on that a bit. Amazing work! Omg the bg is beautiful! Love it! woah, for me! thanks Sani! Can't wait to see what you'll do next, I hope you thesis came around all right? "This is a really lovely wallpaper ! I just love it <3 Your painting is really beautiful and clean (and he looks hot :3)"
Really nice Wallpaper!...Thanks for sharing!